A close-up of edamame in a bowl. The more protein you obtain from plant-based sources instead of animal sources like red meat, the lower your risk of heart disease, cancer and diabetes, reports the Harvard School of Public Health. Nuts, seeds, soy products and whole grains like quinoa may leap to mind when you think of high-protein plant products, but many vegetables are also good ways to fulfill your daily requirement. Aim to eat a variety of vegetables each day. According to the U.S. Department of Agriculture, cooked green soybeans -- also known as edamame -- contain 22 grams of protein in a 1-cup serving. Men need approximately 56 grams of protein per day, and 1 cup of edamame would supply nearly 40 percent of that requirement. For women, who should have 46 grams daily, each cup would be 48 percent of their protein needs. 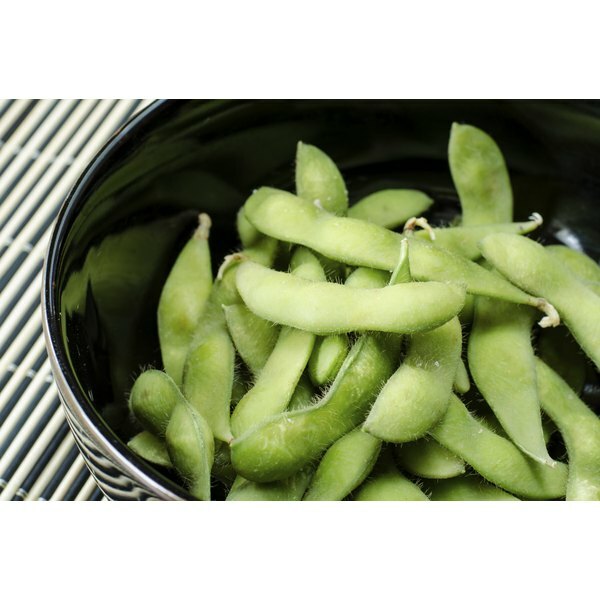 Edamame is a complete protein: It contains all of the amino acids your body requires. Steam the pods and eat the seeds as an appetizer or add the shelled seeds to stir fries or soups. All beans and legumes are an excellent source of protein. 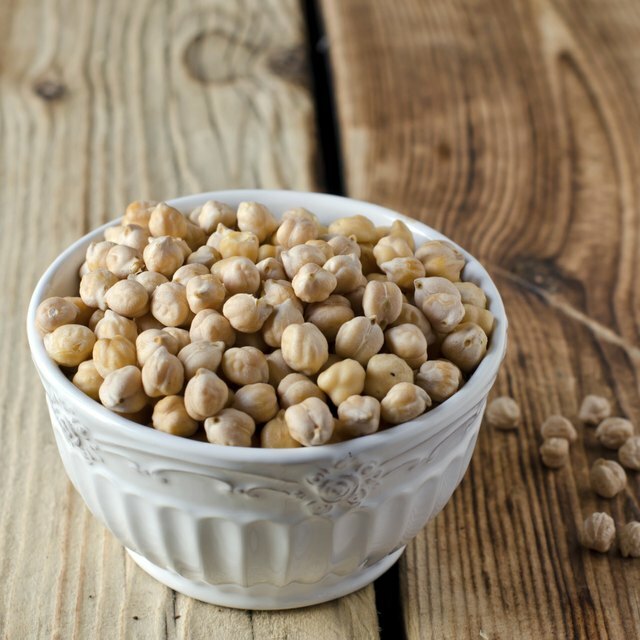 Black-eyed peas have the most, with 14 grams of protein in each cooked cup -- 25 percent of a man's recommended daily allowance and 30 percent of a woman's -- while cooked lima beans have 12 grams per cup, or 21 percent of the RDA for men and 26 percent for women. Beans and legumes are considered incomplete proteins because they lack some essential amino acids. You can obtain these by eating a variety of other vegetables and whole grains throughout the day. While dark green, leafy vegetables are most known for their high concentration of essential nutrients like vitamin K, potassium, calcium, iron, magnesium and fiber, some are also rich in protein. A cup of cooked chopped broccoli provides 5.7 grams of protein -- 10 percent of a man's 56-gram daily protein requirement and 12 percent of that for a woman. Turnip greens have 5.5 grams of protein per cooked cup, and a cup of cooked asparagus has 5.3 grams. Supplement these vegetables with grains like brown rice or whole-wheat pasta for complete protein. Winter squashes are a superior source of protein when compared to most vegetables, though the Hubbard squash variety stands out from the rest. Each 1-cup serving of baked, cubed Hubbard squash fulfills 9 percent of the protein requirement for men and 11 percent of the requirement for women with its 5.1 grams of the nutrient. Use cooked, mashed Hubbard squash as a nutrient-dense substitute for mashed potatoes or add cubes of the vegetable to braises, stews or soups. Whole grains and other high-protein plant foods eaten throughout the day can supply the amino acids that the squash lacks.